Load and save your code either in files, or in a database. Change project in one click. Many useful editing features. Example: juste type a line number in the input field and the code is displayed. Comment/uncomment in one click. Supports all popular programming languages, markdown and HTML. 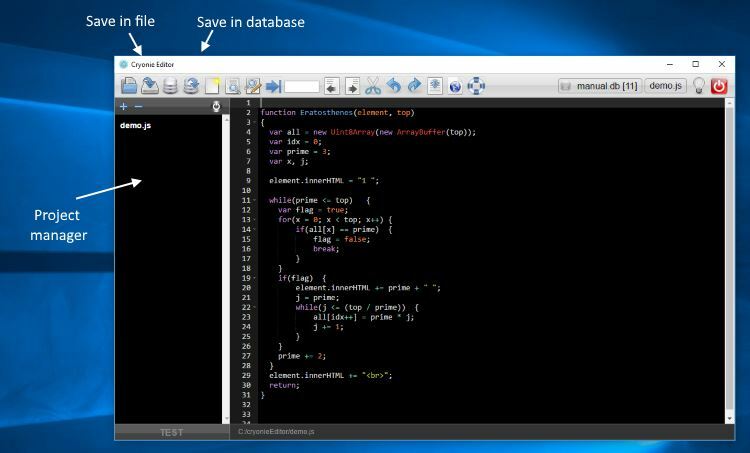 The database then works like a module, with the advantage you can change the content or add new functions dynamically. Your program can become evolutive, learn from its results and then modify its methods and replace them to the base. Download Cryonie and extract the contents. The system will update the electron path. The working directory is that of Cryonie. You can start then the program by clicking on the icon.